The Atlanta Braves are a step closer to moving out of downtown Atlanta, the Major League Baseball team’s home for the past 47 years. The Cobb County Commission in suburban Atlanta voted 4-1 Tuesday night to approve a new $672 million stadium, which officials hope to open for the 2017 season at a site 10 miles northwest of the Georgia capital city’s downtown. The vote followed public comment for and against the deal, which will require millions of dollars in public funds. The project is set to take the team out of downtown Atlanta for the first time since it moved to Georgia from Milwaukee in 1966. Commissioners have been holding town hall meetings to gather feedback on the proposal and held an extended public comment period at their meeting Tuesday night. They voted in favor of the deal despite calls by a diverse coalition of citizen groups for more time. Four of the five commissioners, including commission Chair Tim Lee, said they’d had extensive talks with the Braves and felt they had enough information to believe this would be a positive development. Commissioner Lisa Cupid was the lone dissenting vote. Cupid said she supports the Braves moving to Cobb County, but thinks the process moved forward too quickly and that she still has some lingering concerns. Mike Plant, the Braves executive vice president of business operations, said the deal couldn’t wait if the stadium and entertainment complex are to be completed for the 2017 season. The Braves stunned local leaders and fans just over two weeks ago when they announced their planned move. But Braves executives and Cobb commissioners said planning had been underway for months and wasn’t rushed or hasty. The 30-year agreement calls for a mix of reallocating existing property tax revenue and implementing new taxes on business and tourism to pay for the new stadium at the intersection of Interstates 75 and 285. The team’s current lease at downtown Turner Field, which is jointly owned by Fulton County and the city of Atlanta, runs through the 2016 season. Those addressing commissioners during a public comment period had mixed opinions. Yet some speakers spoke out against the propsal under any circumstance, while others said they wanted a delay because they thought the process seemed rushed and lacked transparency. A diverse coalition of citizen groups argued for more time. 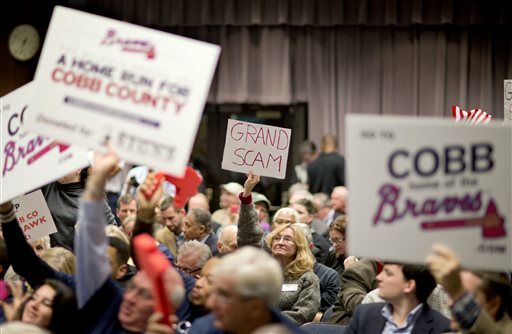 Leaders of the Atlanta Tea Party, Common Cause of Georgia and the Sierra Club, among others, had asked for a 60-day delay, saying voters in the suburban county haven’t had enough time to consider details of the project. The memorandum of understanding between the county, the Cobb-Marietta Coliseum Exhibit Hall Authority and the Braves that was voted on by the commission calls for $300 million in upfront taxpayer support for the stadium. The payment would come from existing property taxes that now pay off debt for park projects and from lodging taxes, a rental car tax and levies on business in a special commercial district around the stadium site. The Braves’ initial contribution to the project would be $280 million. The remaining $92 million would come from debt the county assigns to the team, bringing the Braves’ share to $372 million, or 55 percent of the total. The Braves have promised to cover construction cost overruns. But the team also reserves the right to reduce the total cost of the project by $50 million, absorbing all the savings without reducing the public contribution. The total $672 million construction estimate does not include stadium maintenance and capital improvements, which the team and the county would share over the 30-year agreement.